Honda hopes the shape of the Insight hybrid will increase its conquest potential. MINNEAPOLIS — Does the North American market really need a hybrid sedan? Truck sales dominated the Canadian market in May, accounting for 69 per cent of total new-vehicle sales. It’s a similar scene in the much larger U.S. market. But it doesn't matter. Honda is bringing the redesigned Insight to market, and its dealers will have to sell it in a shrinking sedan segment, one that’s getting more crowded for hybrids. For Honda, that means finding the 2019 Insight a patch of real estate where it doesn't cannibalize Honda's Accord Hybrid or Clarity plug-in hybrid, and where it can compete well against the Toyota Prius and challengers such as Hyundai's Ioniq family. The tight spot has Honda targeting the Insight, which is priced below the Accord and Clarity, at younger buyers who haven't begun families and are described as "style-, image- and eco-conscious." Honda Canada said Monday the Insight Hybrid starts at $29,645 while the Insight Hybrid Touring starts at $33,245. Prices include delivery. All Insights sold in Canada come standard with multi-element LED headlights, push-button start, and the Honda Sensing suite of advanced safety and driver-assistive technologies. Standard connected elements include an eight-inch display audio with Apple CarPlay and Android Auto integration. The Insight Hybrid Touring adds leather seating surfaces, power sunroof, four-way power passenger seat, Honda Satellite-Linked Navigation System and more. The 2019 Insight is powered by the third generation of Honda’s two-motor hybrid drivetrain. A 1.5-litre DOHC i-VTEC Atkinson-cycle inline-four engine with 40.5 per cent thermal efficiency is paired to an electric propulsion motor that produces 197 pound feet of torque for a total output of 151 horsepower. The automaker is trying to position the Insight to avoid turf battles with its hybrid sedans and the unelectrified Civic, whose highway fuel economy is estimated at 42 mpg or 6.8 litres per 100 kilometres. Honda has committed at the corporate level to far greater electrification across its lineup, seeking to have two-thirds of its global vehicle sales come from electrified vehicles by 2030, with a faster ramp-up in Europe and more electrified variants of its core nameplates. But like other automakers facing stricter regulations across the globe, it faces a delicate task in marketing its green vehicles to North American customers who have shown more interest in size, utility and driving dynamics than fuel economy. The Insight, for its part, has a poor record of breaking through. Though it was the first gasoline-electric hybrid sold in the United States, the nameplate was quickly eclipsed by the Prius as a volume seller and a status symbol. The 2019 Insight, Honda says, will be the entry point to its expanding electrified lineup. The Accord Hybrid, on the other hand, is costlier, larger and directed at young families. The Clarity plug-in variant, sitting at the top of Honda's hybrid totem pole, is meant for an older buyer profile. 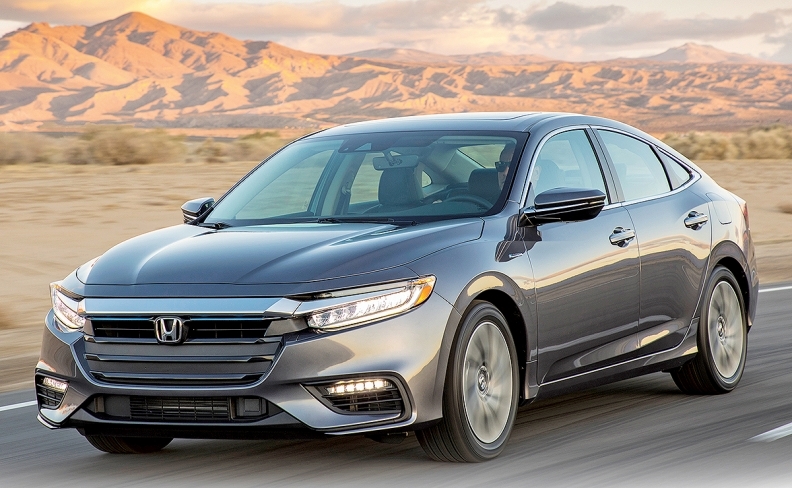 For younger consumers, Honda says the Insight is a more sophisticated, refined alternative to the "youthful, sporty Civic." The automaker believes it has found a home for the Insight between the upper end of the Civic and the lower end of the Accord, said Jay Joseph, American Honda's head of product planning, during a media presentation in Minneapolis earlier this month. The premise is that it's a capable, stylish sedan that happens to be a hybrid, capable of 55 mpg — or about 5.1 litres per 100 km — in the city and combined fuel economy of 52 mpg or 5.4 litres per 100 km. Joseph said the Insight's design will play a critical role in separating it from Honda's other sedans and shaping its identity when it reaches dealerships this summer. It's a far cry from the styling of previous generations, which switched from awkward science experiment to Prius clone. "The key to [its positioning] upfront was separating it physically from the other cars. We chose to invest in giving it unique styling," Joseph said of the Insight, whose underpinnings are based on the 10th-generation Civic. "Most of what you see and touch on that car is unique to the Insight." Honda hopes the modest, Accord-like shape will be an attractive alternative to the polarizing creases of the Prius, while opening up conquest potential to traditional compact sedans such as the Mazda3 and Volkswagen Jetta. Dave Sullivan, an analyst at AutoPacific, says the Insight will present some "very good competition" for the Prius, but he doesn't expect the Insight to eat heavily into Prius sales. Prius buyers, he said, are a different breed. AutoPacific forecasts that U.S. Insight sales will be around 28,000 in 2019 when it has a full year under its belt. He expects the EX to be the most popular. Canadian forecasts weren’t made. The Insight has three drive modes: normal, ECON and sport, which Honda says gives it "sporty-feeling acceleration with sharper throttle response." "The stereotype of hybrids is that you're sacrificing performance for fuel economy," Sullivan said, though Toyota touts a more sporty Prius. "If they're truly able to offer something that breaks up the stereotype of being stuck behind a Prius, it's definitely a compelling reason to look at one if you're in the market for a hybrid."